Does The 5am Club know the secret? If you didn’t know yet, I’m slightly obsessed with learning about efficiency and productivity in my efforts to overcome perfectionist traits. Or at the very least, use this quality to my advantage by optimizing processes in all aspects of my life. I read that the most successful people find success through positive habits maintained over time. If you have a crazy dream, you need to schedule in the steps to get there. Eventually scheduling becomes a habit and you’re that much closer to reaching the big one. I already wrote about finding motivation in a season of challenge and about a few of my favourite healthy habits to add a little mindfulness to your life, but I find these topics so interesting that I needed to explore more. This blog has turned into almost a brainstorm on a page that blends the previous two with a bit of reading I’ve done lately. Something I know: Consistency is the key to success. Talent and skill mean nothing if you don’t put in hard work over time. Along those same lines, I’m learning that automation is a small business owner’s best friend. And if we can automate our workflows, is it possible to automate aspects of our life? I think it can be done. Others seem to agree. Prioritize your to-do lists: Remove the least important tasks when your day starts to get out of hand. Along the same lines, some people swear by the golden number of no more than six tasks per work day. Focus on attention management rather than time management. Combat the distractions of technology by turning off notifications or even keeping your phone away from your work station. Cross the most challenging (or most annoying) tasks first to prevent procrastination. This could be one large to-do you’re dreading or a series of small ones that pile up. From recent reading I’ve learned that plenty of people have studied how to become more efficient over the years and the general consensus seems to be rooted in sustainable healthy habits. Minimize small decisions by transforming them into routines. By default, you’ll have more time to dedicate to the big stuff and will feel more in control of your days. Similarly, if you consistently and deliberately practice your craft, you will end up in the top percentage of your industry. In business, routines and processes—are they habits too?—translate to growth. The goal is to spend more time making moves and less time moving paper around your desk. Everyone is different. My bit of research led to debunking the myth that it takes 21 days to form a habit. It actually takes a lot longer. On average, at least 66 days. The kicker? Sequential days don’t matter. The “Seinfeld Strategy” is to not break the chain. Buy a calendar then choose a single, realistic habit you want to form. Every day you do that action, “X” the day on your calendar. Jerry Seinfeld apparently did exactly this to practice writing funnier jokes and now he’s a millionaire because he didn’t want to break the chain. Stephen Covey has a whole arsenal to draw from in his book 7 Habits of Highly Effective People. The subsections alone tell the story: be proactive, begin with the end in mind, put first things first, think win-win, etc. How long does it take for your newfound routines to pay off? Apparently, all the greats lived through 10 years of silence—silence from their audience, that is. Kobe Bryant and Mozart have different crafts, but their systems are similar. Both practiced deliberately for years before others noticed. Deliberate practice is the idea of focusing on specific outcomes or goals rather than the time dedicated to hard work. Instead of saying “I worked X amount of time,” say “I accomplished X task.” Both continued to practice intentionally, dedicating more time than their peers to practicing. 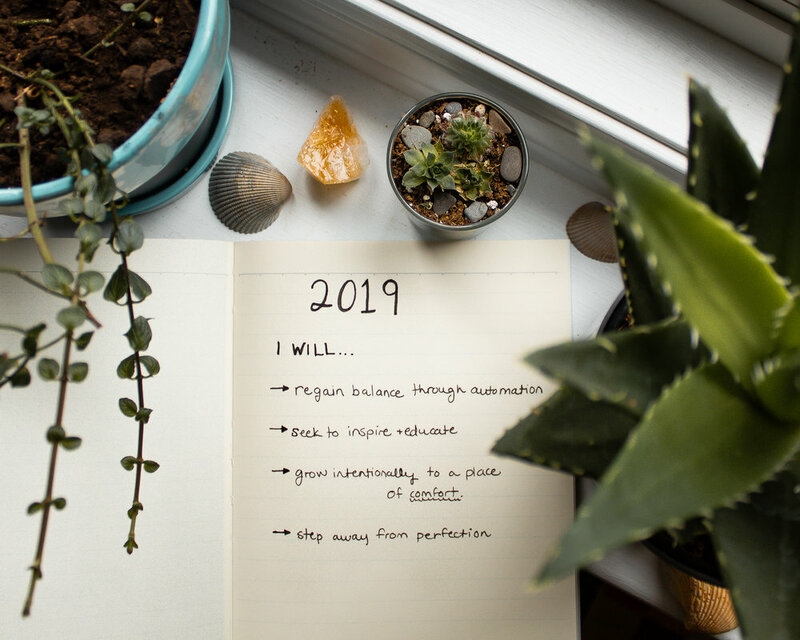 I organized my goals for 2019 into four larger intentions. I broke these into actionable, smaller goals, beginning with a list of steps for January. In January, my focus was creating valuable content and learning how to optimize processes. From there, I scheduled time blocks into my calendar over the entire month to dedicate to producing this content. In terms of my personal life, I set health and wellness goals. For example, continuing to consistently schedule spin and hot yoga classes. Pre-booking these classes adds a level of accountability I was missing before. I’ve lost my mindful morning routine that I love, but that’s the next step to regain the balance I know I need. My goals haven’t been met without roadblocks. I’ve crossed a few steps off my list for January, but my biggest pain point is efficiency. How do I optimize my time to produce content at the pace I’m aiming for? This is where all this talk of habits came from. I think I might try an experiment. I’m reading The 5am Club: Own Your Morning. Elevate Your Life. by Robin Sharma right now—I’m sure the topic of discussion is obvious. Is waking up at 5am consistently the first step in forming these healthy habits? That’s where I’m at right now. I’d love to know your thoughts on the topic, friends!